Nvidia cranks out a new Titan X, we tell you what you need to know about selecting a PSU, and more! We can't remember the last time there was so much happening in the graphics space. Over the course of the past couple of months, both Nvidia and AMD have released brand new GPU architectures, followed by a seemingly steady stream of exciting new graphics card launches and announcements at different price points. The latest of those is a new Titan X that comes ready to crush 4K resolution gaming. The past week has also seen the PC gaming category gain an enthusiastic celebrity who built his own rig, the resurrection of Seagate's Barracuda line, Oclulus finally catching up on pre-orders, and more. 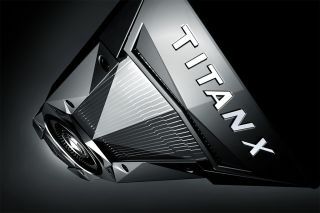 Only a couple of months after the release of its potent GTX 1080 GPU, Nvidia has announced a new Titan X card—and it will be to the 1080 what the 1080 was to the previous Titan X. The new card is built with Nvidia's Pascal GP102 architecture and will cost $1,200, which is twice as expensive as the 1080. It boasts 3584 Nvidia CUDA cores running at 1.5GHz, and delivers 11 teraflops of performance. For some context, the previous Titan X delivered around 6 teraflops, while the 1080 boasts 8 teraflops. Suffice it to say, with 12GB of GDDR5X memory to boot, it looks to be a blindingly powerful card. If you like graphics cards as much as we do, this year has been awesome. Not only did we get the above Titan X announcement, but we've been treated to a near-constant stream of new hardware. GTX 1080, GTX 1070, and now GTX 1060 have all improved the performance offered at their respective price points, and AMD's RX 480 (and upcoming RX 470 and 460) are doing the same. There's only one real problem with the cards just mentioned: They've all been more than a little difficult to find, particularly in the US market at anything close to the bottom end of the price range. Nevertheless, Nvidia launched their GTX 1060 this week, based on a smaller GP106 architecture that's about half the size of the 1080's GP104. Seagate is resurrecting its Barracuda brand to designate one of several purpose-built 10TB capacity hard drive options under its new Guardian Series umbrella. It's part of a branding play that also includes 10TB HDD options dubbed IronWolf and SkyHawk. The 10TB Barracuda Pro takes aim at gamers and PC enthusiasts in need of "high capacity storage at an affordable price point." While Seagate's press release doesn't mention pricing, Engadget says the MSRP stands at $535. That might be a tough sell when you can hop on Newegg and pick up Seagate's 8TB Archive HDD for $260. Newegg seems to think it will sell well, though. Terry Crews has joined the PC gaming club, as he gleefully proclaims in a Facebook video showcasing a list of parts he purchased as he prepares to build a system from scratch for the first time. If the name isn't familiar to you, the face probably is. Crews is a former linebacker in the NFL, having been drafted by the Los Angeles Rams in 1991 and finishing his football career with the Philadelphia Eagles in 1996. He also had stints playing for the San Diego Chargers and Washington Redskins, along with the Rhein Fire, a football team in NFL Europe. After retiring from pro football, Crews began acting, scoring roles in White Chicks, Friday After Next, Training Day, The Longest Yard, The Expendables 3, and various other flicks. More recently you might have seen him in one of several Old Spice commercials and the TV show Brooklyn Nine-Nine. Crews is also a dad, and that's part of what drew him to build a gaming PC, which will replace an iMac that sits on his desk. One week ago, former NFL linebacker and current action hero Terry Crews announced his intention to build his very own gaming PC, after getting hooked on the habit during EA's Battlefield 1 livestream at E3. And now the job is done—but he wants more power! Acer just leveled up its Predator G1 gaming desktop with Pascal, equipping the compact system with a GeForce GTX 1080 graphics card. It's available in the Predator G1-710-70001, a limited edition model that's now up for pre-order at Newegg and Acer's own web store, and it comes with a couple of bonuses. Acer will toss in a wheeled carrying case and Tom Clancy's The Division on DVD (both while supplies last) with the purchase of a qualifying Predator desktop. A carrying case for a desktop may seem like an odd thing to bundle, but since its unveiling three months ago, Acer's talked up the Predator's compact design. As AMD's hardware partners often do, Asus thought it could improve upon the reference design of the Radeon RX 480, and the result is a factory overclocked ROG Strix RX 480 card that can be further tweaked at home without fear of burning up your motherboard. A little back history is in order. It was recently discovered that AMD's reference RX 480 was pulling more wattage from the PCIe slot than the spec allows for, which is 75W. Some sites also found that the overall power draw often exceeded the AMD's 150W claim. Asus looks to address both of these concerns with their Strix 480. AOC might be fashionably late to the curved display party, at least in the U.S., but with the introduction of the C358FQ it can finally boast a curvy option for those who want one. The C358FQ is a 35-inch monitor with a 2560x1080 resolution (21:9 aspect ratio). It also sports a 144Hz refresh rate, 4 response time, 300 cd/m2 brightness, and 50,000,0001:1 dynamic contrast ratio. AOC opted for an LED backlit VA panel with a 2000R curvature, same as BenQ's 35-inch XR3501, a monitor with similar specs that streets for $850 to $900. It started with a clicky-popping noise and a black screen. There was an acrid smell of burning electronics, and a thin wisp of smoke rising from the computer tower. And with that, thoughts of playing World of Warcraft or Quake 3 Urban Terror needed to be put on hold for a few days. My power supply had failed, and luckily I was just out of a PSU, and not an entire system. Read on for Alex's advice on what to look for when choosing a power supply for your next gaming PC. He discusses how much power do you really need, what's with the 80 Plus ratings, is it better to go modular or fixed cables, and more. When Doom launched back in May, we were promised that a patch with support for the Vulkan API would show up "soon after launch." That apparently meant around two months. The good news is that after all this waiting, the public Vulkan patch went live last week; there's also a FAQ on Doom's Vulkan support that has additional information. Jarred tackles the arduous task of retesting a ton of graphics cards with the latest drivers using the OpenGL 4.5 and Vulkan APIs to see how the cards stack up. Vulkan is supposed to improve performance, and it does...at least if you have the right hardware. If the only reason you're still using a mechanical hard drive for storage chores is capacity, not price, then Samsung's new 4TB 850 Evo solid state drive might be of interest. It's not the most capacious option out there—HDDs still offer greater amounts of bulk storage—but it is the biggest consumer SSD with plenty of room to hold large photo collections, videos, games, and so forth. The new 4TB option doubles the capacity of Samsung's Evo SSD line, which previously topped out at 2TB. That additional storage adds up to a $1,500 price tag, however. At that price, you may have to decide between paying rent for the month or screwing over your landlord for a faster bulk storage option than that aging HDD provides. Use your own judgement on that one. It's taken Oculus a few months to sort through its production shortage of Rift headsets but at long last all pre-orders have now shipped out, the company announced today. Furthermore, Oculus promises that all new orders will ship in two to four business days. Oculus first began taking pre-orders for its $599 VR headset back in early January. At the time, it was telling customers the Rift would ship on March 28. Despite the higher-than-expected price tag, Oculus quickly sold out of its first batch of Rift headsts and had to push back the estimated ship date for new orders. The extended wait didn't sit well with customers, which prompted Oculus to refund shipping costs. Going forward, Oculus doesn't anticipate any further shipping delays. Razer has begun taking pre-orders for its new Abyssus V2 gaming mouse, a low-frills rodent that doesn't shun left-handed players. Same goes for right-handed gamers thanks to its ambidextrous design. Like the original Abyssus, this new model is a "basic-but-versatile" mouse that's suitable for a range of playing styles. The Abyssus V2 sports a 5,000 DPI optical sensor, up from the original's 3,500 DPI sensor, along with a dedicated cycling button for toggling between up to five different customizable DPI settings.